Lunagirl Moonbeams by Lunagirl Vintage Images: Favorite Flowers -- Join the Challenge! I'm happy to have a couple of entries in my "Flowers & Fans" challenge today ~ I hope to see lots more! I've been researching flower meanings again today, and I added a couple of new ones to my Language of Flowers page at Lunagirl.com. It seems various "flower dictionaries" might disagree about the meaning of a particular type of flower, but I've tried to use the most agreed-upon and authentic meanings I could find, based on Victorian sources. And some flowers have come to have recognized meanings -- such as red roses for romance, for example. Did you know that red roses can also be a symbol of Divine Love? Yellow roses are for friendship or platonic love, pink for admiration and appreciation. White roses to the Victorians often stood for purity or humility; to us they are often used to express condolences or sympathy. Here are some pansies, which most every Victorian flower dictionary agrees symbolize "thinking of you" or thoughtfulness. 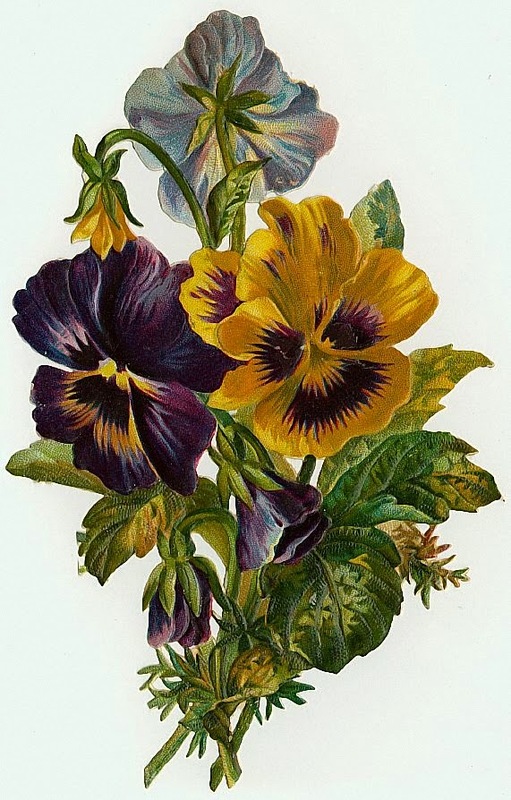 Did you know the name "pansy" comes from the French word pensee, meaning thought? Pansy flowers look like pensive little faces, don't you think? An iris can mean "a message." I'm guessing that's because in Greek mythology Iris was a messenger. She was also goddess of the rainbow -- leaving a brightly colored trail across the sky -- and irises are known for coming in many different colors! Did you see all the thousands of ceramic red poppies around the Tower of London? That was such a beautiful memorial for those who died in World War I. Poppies (the source for opium) are associated with sleep and also traditionally with death and memorials. After World War I ravaged the landscape of Europe, only the native blood red poppies would grow in the bare exposed earth. Fields of red poppies filling barren battlefields became a symbol of the sacrifice of those who died, and a flower of remembrance for those who lived on. 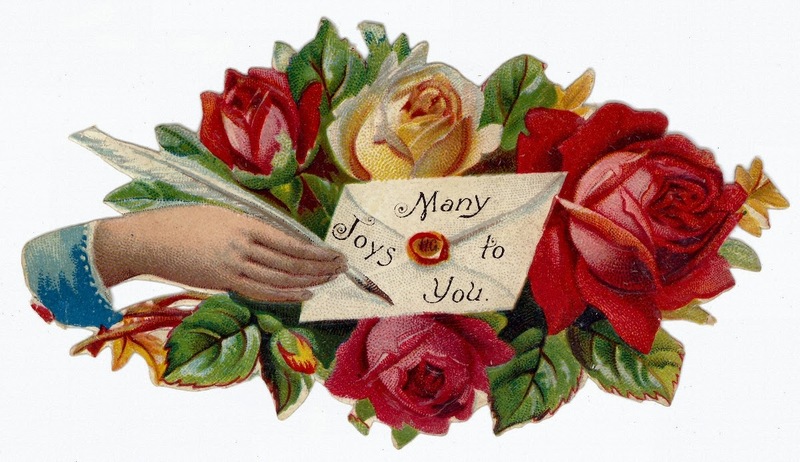 I love the idea of adding herbs to bouquets, which the Victorians often did. Herbs add fragrance and greenery, and they have symbolic meanings, too! Rosemary for remembrance, thyme for courage, basil for luck and fame... I need to learn more of those. Finally, one of my favorite flowers is Zinnia -- because zinnias come in so many colors, because they're so easy to grow, but most of all because they grew all along the fence at the cabin where my husband and I first lived. Zinnias will always remind me of our first two summers together at our first home. The traditional meaning for zinnias, however, is "thoughts of absent friends." Isn't that just lovely? What are your favorite flowers? What memories or meanings do you associate with flowers?